BARSKA, with corporate offices, warehouse and distribution in Pomona, CA (Southern California), is a worldwide sport optics company with strong brand recognition in the optics industry. BARSKA offers an extensive line of precision sport optics products ranging from binoculars, riflescopes and spotting scopes to telescopes. BARSKA is committed to delivering a superior quality product at an affordable price to our customers around the world. BARSKA's product range has been designed and built with the latest optical technology allowing you to enjoy all your favorite leisure time outdoor activities even more. 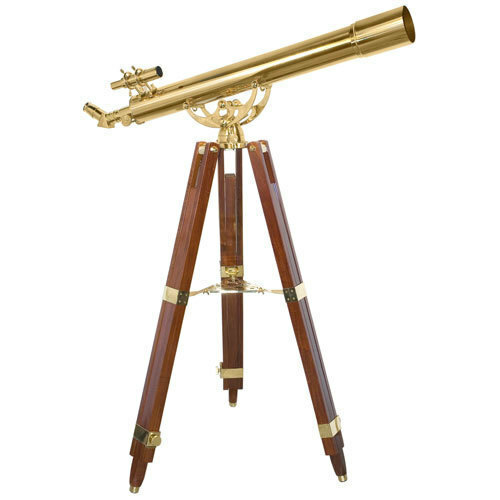 The 36 Power Anchormaster Refractor Telescope is elaborately detailed with elegant polished brass. The high quality, fully coated achromatic lenses and Plossol eyepieces with a rack and pinion focuser deliver brilliant images. This telescope is structured in a refractor telescope design with helical focusing ring and comes equipped with 45 erecting diagonal for correct image of land viewing. 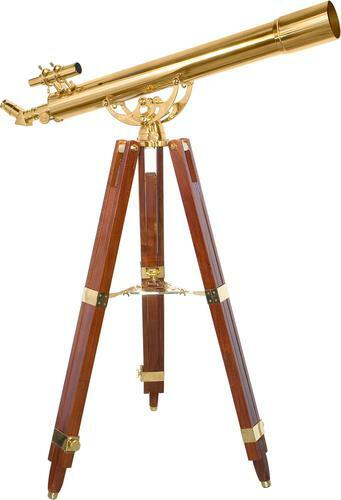 This beautiful telescope is mounted on a brass cradle mount which allows the scope to move smoothly in all directions. The handcrafted mahogany tripod with extendable legs and polished brass stabilizing chain accents your home beautifully. The Anchormaster Telescope is ideal for celestial viewing of planets or terrestrial viewing of the beautiful cityscape. At Give 5 to Cancer, we are committed to providing our customers with the highest quality products and customer service, while supporting a great cause. We belong to The Breast Cancer Research Foundation’s Survivor's Circle Partner Program. Give 5 To Cancer will be donating $1 to The Breast Cancer Research Foundation & The Bismarck Cancer Center Foundation for every product sold, in order to achieve prevention, and a cure for cancer in our lifetime. The team at Give 5 to Cancer also hosts a charity golf event, The Volkowitsch Open, each spring that donates to both of the foundations, as well as raising cancer awareness. Besides donating proceeds and hosting an annual charity event, our founder, Loren, is on The Bismarck Cancer Center Board here in Bismarck, and volunteers monthly to help support the foundation. Our team at Give 5 to Cancer walks the walk when it comes to volunteering, donating, and raising awareness for the cancer cause. We invite you to browse through our store and shop with confidence. Thank you for visiting! Items must be returned in NEW & UNUSED CONDITION. The condition must be the same as it was when delivered to you from the warehouse. DAMAGE DUE TO SHIPPING, OR MANUFACTURING DEFECTS, MUST BE REPORTED WITHIN 3 BUSINESS DAYS OF RECEIVING THE PRODUCT TO QUALIFY FOR REPLACEMENT OR A REFUND. Refunds will be granted for items returned within 30 days from when the item was received, the refund will be credited in the same form as the original payment type. The original shipping and handling charges are not refundable unless item was proven defective. Please mail your package in a prepaid, insured, traceable method to the address below. If you have an exchange, additional shipping or handling charges may be incurred. Returns, errors in purchasing and refused shipments are subject to an additional 20% restocking fee depending on the size and value of the product. Please contact us if you have any questions regarding our return policy. If you mistakenly ordered the wrong size hat or discovered post-order that you would prefer another size please contact us and we will provide return address to send the hat back to. Customer are responsible for the cost of return shipping as well as the shipping to you of the correct size. ALL RETURNS of hats will be charged a 20% restocking fee. At this time, Give5ToCancer ships merchandise to locations within the United States and U.S. territories, including Alaska, Hawaii, Puerto Rico, Guam, and the US Virgin Islands. For Domestic orders please allow a full 7-10 business days for items to arrive. Additionally, Give5ToCancer ships merchandise to Canada and Mexico, and all other international locations. Customer must please allow appropriate amount of time 2-3 weeks for items to arrive to international addresses. Customs and import duties may be applied to International orders when the shipment reaches its destination. Such charges are the responsibility of the recipient of your order and vary from country to country. Contact your local customs office for details. Shipping laws are different in each country. It is your responsibility to check with your Customs office to verify whether the country to which you are shipping permits the shipment of your products. Give5ToCancer is not responsible for any direct, indirect, punitive, or consequential damages that arise from improper international shipping practices.